Fans of the Back to the Future trilogy know that October 21, 2015 is an extremely important day in history—the day to which Doc Brown and Marty McFly travel in the second movie. Toyota fans know that it’s a doubly important day, because it’s today that the automaker releases its first hydrogen-powered vehicle. 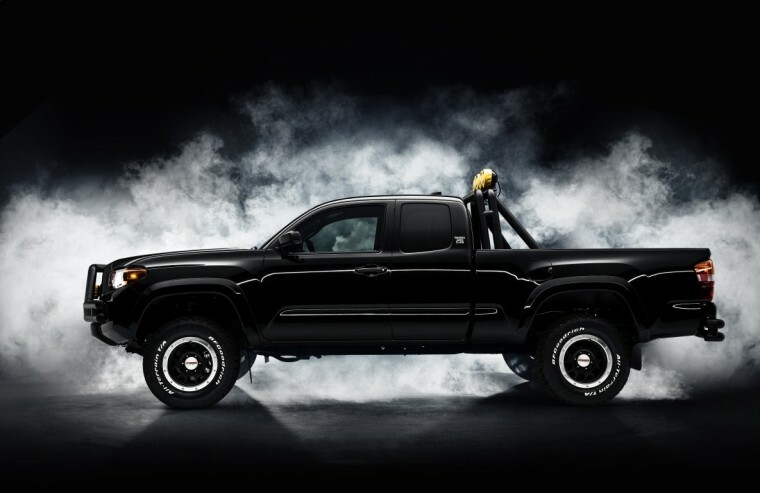 But today is actually triply important to fans of both BTTF and Toyota, because the automaker has unveiled a custom Tacoma designed to look like Marty McFly’s dream truck from the movie. You know–the one Marty drives around Hilldale which Biff Tannen is forced to wax at the end of the first film. This decked-out 2016 Tacoma features various components of the 1985 Toyota truck—its exterior black paint, hulking mud flaps, and vintage headlight-taillight design. The truck also comes with off-road suspension, TRD wheels, a custom light bar, custom front and rear tubular bumpers, custom “D-4S” fuel injection badging, and a custom tailgate with an iconic “TOYOTA” logo. All it’s missing is its 2BAK860 license plate. Today only, the truck will be on display in major tourist destinations in New York, Los Angeles, and Dallas.